Red tide has not caused any fish kills or respiratory irritation anywhere on the Texas coast since early November. TPWD received a report of discolored water in Corpus Christi Bay on November 30; however, no reports of dead fish or aerosols accompanied the sighting. Texas gulf beaches continue to be free of red tide, and there are no recent reports of dead fish or respiratory irritation in the Corpus Christi area. Red tide cells are still being found at the intake for the Department’s CCA/CPL Marine Development Center in the upper Laguna Madre. Recent samples taken at the University of Texas Marine Science Institute on the Corpus Christi Ship Channel showed very low levels of red tide. No aerosol effects have been reported in Port Aransas. The presence of red tide in Aransas Bay has delayed the opening of the shellfish harvest season there. However, red tide has not been observed in Mesquite Bay, San Antonio Bay or Matagorda Bay. TPWD has received no reports of dead fish or respiratory irritation in the South Padre Island area. Recent water samples examined by University of Texas Pan American Coastal Studies Lab and Cameron County Extension Agent Tony Reisinger have contained little to no red tide cells. Texas gulf beaches continue to be free of red tide, and no reports of dead fish or respiratory irritation have come in from the Corpus Christi area this week. Red tide cells are still being found at the intake for the Department’s CCA/CPL Marine Development Center in the upper Laguna Madre. Yesterday’s samples taken at the University of Texas Marine Science Institute on the Corpus Christi Ship Channel showed very low levels of red tide. No aerosol effects have been reported in Port Aransas. Water samples taken near Mud Island on Monday by the Texas Department of State Health Services (TDSHS) contained low levels of red tide cells; TPWD Coastal Fisheries staff were also out that day and did not observe any discolored water. The presence of red tide in Aransas Bay has delayed the opening of the shellfish harvest season there. However, red tide has not been observed in Mesquite Bay, San Antonio Bay or Matagorda Bay. TPWD has received no reports of dead fish or respiratory irritation in the South Padre Island area. Recent water samples have contained little to no red tide cells. Red tide continues to show up at low levels in Port Aransas near the University of Texas Marine Science Institute on the Corpus Christi Ship Channel. No aerosol effects have been reported in Port Aransas. Red tide has also appeared in Aransas Bay, which has delayed the opening of the shellfish harvest season there. Red tide continues to be present in Corpus Christi Bay in low levels, but high levels were measured at the Laguna Shores marina. Red tide cells often occur at higher levels in marinas and canals where water circulation is restricted. Red tide has not been observed in Mesquite Bay, San Antonio Bay or Matagorda Bay, and the gulf beaches also appear to be free of red tide. In south Texas, water samples contain very few or no red tide cells, according to reports from the University of Texas Pan American Coastal Studies Lab and Cameron County extension agent Tony Reisinger. No aerosol has been detected for two weeks in the South Padre Island area. Red tide continues to show up at low levels in Port Aransas near the University of Texas Marine Science Institute on the Corpus Christi Ship Channel. No aerosol effects have been reported in Port Aransas. Red tide has also appeared in Aransas Bay, which has delayed the opening of the shellfish harvest season there. Red tide continues to be present in Corpus Christi Bay, and samples taken in the Oso Bay area this week showed low to moderate levels of red tide cells. Red tide cells were detected at the intake for the Department’s CCA/CPL Marine Development Center in the upper Laguna Madre. Red tide has not been observed in Mesquite Bay, San Antonio Bay or Matagorda Bay, and the gulf beaches also appear to be free of red tide. In Corpus Christi Bay, winds have pushed the red tide back toward downtown Corpus Christi. Dead fish were seen yesterday washed up on the west side of Oso Bay. Water samples taken yesterday from Oso Bay contained low concentrations of red tide. Samples were also taken from the Upper Laguna Madre, showing low to moderate red tide concentrations. No aerosol effects have been reported in Port Aransas. The gulf beaches also appear to be free of red tide. In south Texas, water samples taken this morning contain very few red tide cells, according to reports from the University of Texas Pan American Coastal Studies Lab and Cameron County extension agent Tony Reisinger. No aerosol has been detected for over two weeks in the South Padre Island area. Red tide cells continue to show up at low levels in Port Aransas near the University of Texas Marine Science Center on the Corpus Christi Ship Channel. No aerosol effects have been reported in Port Aransas. Red tide has also appeared in Aransas Bay, which will delay the opening of the shellfish harvest season there. Red tide continues to be present in Corpus Christi Bay, but has not been observed in Mesquite Bay, San Antonio Bay or Matagorda Bay. The gulf beaches also appear to be free of red tide. 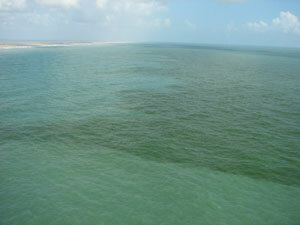 In south Texas, water samples contain very few or no red tide cells, according to reports from the University of Texas Pan American Coastal Studies Lab and Cameron County extension agent Tony Reisinger. No aerosol has been detected for almost two weeks in the South Padre Island area. In south Texas, University of Texas Pan American Coastal Studies Lab staff and Cameron County extension agent Tony Reisinger found very low or no red tide cells in water samples. Reisinger reported a minor fish kill of mullet that probably occurred over the weekend in the southwest Lower Laguna Madre near the golf course at Laguna Vista. No aerosol has been detected for almost two weeks in the South Padre Island area. Last week the Texas Department of State Health Services or TDSHS issued a press release stating that the oyster harvesting season would be delayed in Aransas Bay, Corpus Christi Bay and all of the Laguna Madre including South Bay. The TDSHS reminds the public not to harvest and eat oysters, clams, mussels or whelks from Texas coastal waters while red tide is present. Information about shellfish closures can be obtained by contacting the Seafood and Aquatic Life group of the TDSHS at (800) 685-0361. Red tide cells continue to show up at low levels on the Corpus Christi Ship Channel in Port Aransas near the University of Texas Marine Science Institute. No respiratory irritation has been reported in Port Aransas, and gulf beaches all along the Texas coast appear to be free of red tide. North winds have caused dead fish to accumulate on the shores of Corpus Christi Bay, resulting in noticeable odors and respiratory irritation along the entire length of Ocean Drive. In addition, dead fish have been reported along the southwestern shore of Cayo del Oso. In south Texas, staff of the University of Texas Pan American Coastal Studies Lab and Cameron County extension agent Tony Reisinger found most water samples collected today to be completely free of red tide. A very low concentration of red tide cells persists at the west end of the Queen Isabella Causeway in Port Isabel. No aerosol has been detected for two weeks in the South Padre Island area. Red tide will prevent some Texas bays from being included in the opening of oyster season on November 1. The Texas Department of State Health Services will issue a press release in the coming days regarding the affected bays. In the meantime, the public is reminded not to harvest and eat oysters, clams, mussels or whelks from Texas coastal waters while red tide is present. All Texas coastal water is currently closed to the harvesting of oysters, clams and mussels, except for the commercial oyster harvesting in Galveston Bay. Information about shellfish closures can be obtained by contacting the Seafood and Aquatic Life group of the Texas Department of State Health Services at (800) 685-0361. An overflight was conducted yesterday from San Antonio Bay to the upper reaches of the Upper Laguna Madre. Special thanks go out to the Coast Guard who let TPWD Kills and Spills Biologist Jennifer Bronson ride on their HH-65A Dolphin helicopter for the overflight. No obvious water discoloration was seen in Espiritu Santo Bay, Copano Bay, Lydia Ann Channel or Nueces Bay. Suspicious-looking water was seen in adjacent bays and biologists are following up on the situation. Red tide cells continue to show up at low levels in Port Aransas near the University of Texas Marine Science Center on the Corpus Christi Ship Channel. No aerosol effects have been reported in Port Aransas. However, the north winds are causing aerosols to be particularly troublesome along the entire length of Ocean Drive in Corpus Christi. The gulf beaches still appear to be free of red tide. In south Texas, University of Texas Pan American Coastal Studies Lab staff and Cameron County extension agent Tony Reisinger found most water samples collected today to be completely free of red tide. No aerosol has been detected for over a week in the South Padre Island area. Red tide cells are showing up at low levels in Port Aransas near the University of Texas Marine Science Center on the Corpus Christi Ship Channel. Red tide has also appeared in Aransas Bay, near Mud Island and the Lydia Ann Channel. This will delay the opening of the shellfish harvest season in Aransas Bay. Red tide continues to be present in Corpus Christi Bay, and TPWD staff are following up on a report of dead fish and red tide in Nueces Bay. However red tide has not been observed in Mesquite Bay, San Antonio Bay or Matagorda Bay at this time. The gulf beaches also appear to be free of red tide. In south Texas, University of Texas Pan American Coastal Studies Lab staff and Cameron County extension agent Tony Reisinger found most water samples collected today to be free of red tide. A low concentration of red tide cells persists at the west end of the Queen Isabella Causeway in Port Isabel. No aerosol has been detected for over a week in the South Padre Island area. Red tide continues to be present in Corpus Christi Bay. On Monday a north wind blew dead fish onto the shore near the Texas A&M University Corpus Christi campus. A fish kill suspected to be caused by red tide was reported Monday in a canal near Flint Hills. However red tide has not been observed in Nueces Bay, Mesquite Bay, San Antonio Bay or Matagorda Bay at this time. The gulf beaches also appear to be free of red tide. Red tide continues to be present in Corpus Christi Bay. As of yesterday, the water was discolored along Ocean Drive, especially near Cole Park, near the USS Lexington, the Port of Corpus Christi, and in Portland cove. A fish kill involving thousands of fish was observed in the La Quinta Channel on Thursday. Dead fish were also reported floating out of the Corpus Christi Ship Channel. TPWD received one report of red tide aerosol in Oso Bay near the Naval Base. However red tide has not been observed in Nueces Bay, Mesquite Bay, San Antonio Bay or Matagorda Bay at this time. The gulf beaches also appear to be free of red tide. In south Texas, University of Texas Pan American Coastal Studies Lab staff and Cameron County extension agent Tony Reisinger continue to find low concentrations of red tide in water samples collected yesterday and today. No water discoloration, fresh fish kill, or aerosol was noted at any of the sample sites. Last week the Texas Department of State Health Services issued a reminder to the public not to harvest and eat oysters, clams, mussels or whelks from Texas coastal waters while red tide is present. All Texas coastal water is currently closed to the harvesting of oysters, clams and mussels, except for the commercial oyster harvesting in Galveston Bay. Information about shellfish closures can be obtained by contacting the Seafood and Aquatic Life group of the Texas Department of State Health Services at (800) 685-0361. If you have concerns or questions about human health effects of red tide or symptoms you are experiencing, consult your physician.